Willa meets Hesper on the night Willa is assaulted on the street. They know each from their creative writing program at Columbia, but they haven’t connected until that night. 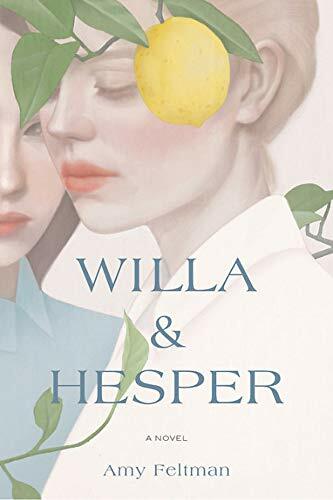 Willa falls passionately in love with Hesper, and the ambiguity of being attacked and falling in love at virtually the same time sets the tone for Amy Feltman’s poignant and poetic Willa & Hesper. While Willa falls in love, Hesper finds Willa’s kindness and stability briefly comforting then stifling. Hesper eventually breaks up with Willa. Devastated, Willa signs up for a guided tour of German and Polish holocaust memorials. The trip is designed to help young Jews learn about their history and deepen their faith. Willa is religious but finds the trip troubling. Her fellow travelers want to go clubbing, and the rabbi who accompanies them makes a spectacle of Willa’s earnest faith. Meanwhile, Hesper, along with her divorced parents, her sister, and her ailing grandfather take a trip to Tbilisi, Georgia, to meet their distant Georgian relatives. While Georgia and Germany are hardly neighboring countries, the parallel journeys set up the expectation that Willa and Hesper will reunite on the other side of the world. They don’t. Willa flees the guided tour and stays with a friend in Berlin. Hesper’s family is temporarily trapped in Tbilisi when a devastating flood tears the city apart (a scene that Feltman renders with exquisite horror). Then Hesper’s family returns home, and Hesper slowly comes to terms with her depression. Willa stays in Berlin and makes her life there. The first-person narrative alternates between Willa’s point of view and Hesper’s. Throughout the novel, Feltman’s supreme ability to capture the emotional reality of her characters’ lives compels the reader forward. Again and again, Feltman hones in on a minute detail so salient it is like DNA, explaining the entirety through the minuscule. Making love with Hesper, Willa thinks, ”. . . I felt invigorated with energy I didn’t realize I had. I’m not fragile, I thought, and my un-fragileness slashed through our kissing, in my motions, a kind of vehemence, or maybe it was violence. . . . But when I got closer, I had to shut my eyes anyway, and then I was alone in that writhing dark lull before it happened, and when I came it was spasmodic, like I was a puppet whose master had dropped the strings.” The moment captures everything that Hesper is and will be to Willa: empowering, devastating, and transcendent. If there is one fault to Feltman’s gorgeous narrative, it is that insight comes at the expense of plot. The events in the novel do not unfold like the plot of every Hollywood blockbuster movie. Nor should one expect a Hollywood plot from a novel whose purpose is so evidently to explore human nature, not sign, seal, and deliver a romantic-comedy-style happily-ever-after. Nonetheless, the reader may find themselves waiting for more to happen or pondering Feltman’s choices. Why does Feltman spend relatively little time on Willa and Hesper’s sexual relationship when it feels important and Feltman is so good at capturing their intimacy? Why does the narrative linger on the awkward, but unexceptional, interactions between Hesper’s divorced parents? These questions will probably yield fruit. Willa & Hesper is definitely a book that gives more and more the longer the reader considers it. The acuity with which Feltman perceives her characters’ inner lives pared with the skill with which she writes, makes Willa & Hesper a successful debut and Feltman a talent to watch. Karelia Stetz-Waters writes lesbian contemporary fiction. Her latest novel is Worth the Wait (Forever Yours/Hachette, 2018).